If you’re looking at used elliptical machines in your search for the perfect balance of high-end features and a reasonable price, you should pat yourself on the back. Today’s used or remanufactured elliptical trainer can be an excellent choice if you buy from a company that specializes in reselling quality exercise equipment. There are companies that specialize in used equipment by putting all of their used equipment through their “remanufacturing” process in order to provide truly high quality and safety to their customers. A remanufactured elliptical machine can seldom be distinguished from a brand new model, but will usually be sold for up to 50% less. Where can you find these used ellipticals? You have a few options. There are some companies online that specialize in refurbished machines. But a good starting point are the used elliptical machines at Amazon, where you will find a wide variety of brand names to choose from including Schwinn, ProForm, Precor and others. So start there on your search. If you can't find it there check out eBay as well as individual sites that specialize in refurbished ellipticals. As with new units, make sure you are aware of the warranty, and if it isn't long enough, opt for one of the protection programs just in case something happens with the machine down the road. The lower end models tend to have shorter warranties to begin with, so just make sure you are covered. The Precor EFX 544 Remanufactured Trainer - Get a health club workout and enjoy the savings. The Precor EFX 546 Commercial Model - Another top machine! Consider a remanufactured model and save. The Precor EFX 556 - One of the most popular machines sold reconditioned. The Precor EFX576i Elliptical Crosstrainer - One of the best high-end Precors ever made. Here’s your chance to snag it at a decent price. The Life Fitness CT9100RD - Save thousands of dollars with the purchase of a reconditioned club model over the price of a new one. The Life Fitness CT9500HR - This is one machine that is worth buying remanufactured if you can’t get it new. Life Fitness 91Xi - Valued for the solid ride, smooth performance; a first choice for advanced cardiovascular training. 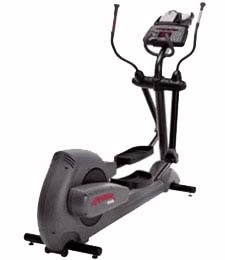 The Life Fitness 95xi - Ergonomic design, auto stride adjustment, natural, smooth elliptical motion.